Today Google is showing a Doodle for the 165th birthday of of Bram Stoker. The desk where Bram Stoker created his immortal 1897 novel Dracula is going up for auction next month. Bram Stoker initially gave the desk to his friend J.S.R. Phillips. The current owner commissioned British-based furniture maker and designer Mark Brazier-Jones to preserve the desk, but also make it a stand-alone art piece. 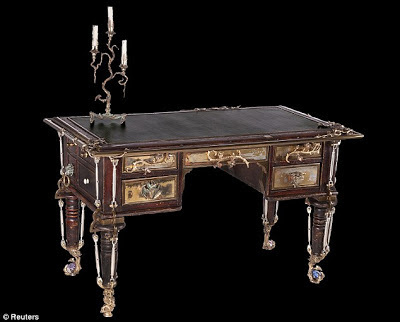 The Auction company expects the desk, along with a matching candelabra designed and crafted by Brazier-Jones, to sell for somewhere between $60,000 and $80,000. Abraham (Bram) Stoker was born November 8, 1847 in Dublin, Ireland, to a family of a civil servant and a charity worker. As a child, Stoker was sickly and spent a lot of time in bed listening to his mother’s horror stories. Dracula was Bram Stoker's fifth and by far his most famous novel. It was first published in the UK in 1897. The classic Gothic novel follows the vampire Count Dracula on his journey from his native Transylvania, Romania, to England, where he is finally slain by a small group of men and women led by Professor Abraham Van Helsing. Although best known for Dracula, Bram Stoker wrote eighteen books before his death in 1912. Watch below the Video about Today's "Bram Stoker Books" Doodle.